This is what American singer Lady Gaga wore to an event in London on Friday. Exactly 3 years after the Bad Romance singer claims she’s being haunted by a male ghost named Ryan, she has made her first public appearance looking exactly like a ghost. In November 2010, Lady Gaga told a UK Newspaper that she’s being haunted by a male spirit named Ryan who travels the world with her. She claims she’s very terrified by the ghost Ryan because he refused to leave her alone. Since then, Lady Gaga has spent tons of money to get rid of the “annoying” ghost spirit but to no avail. 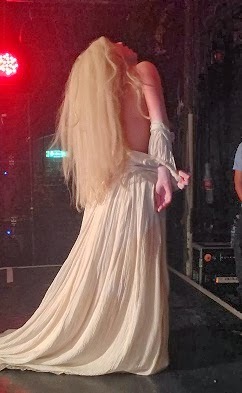 So in London on Friday, Lady Gaga stormed an event dressed in white ghost costume. She arrived in the United Kingdom dressed in a scary Miss Havisham Style dress with no underwear and shoes. Not keen to follow in other peoples’ fashion footsteps, Gaga boldly ignores the trend for big, bushy eyebrows a la Cara Delevingne and opted instead, for bleach-blonde brows. 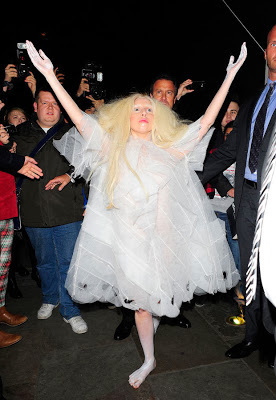 The tattooed singer accessorized her bizarre look by painting her hands and feet white, but Gaga mustn’t of had any shoes that complimented her spooky chic ensemble – so she decided to go barefoot on the dirty London pavement. At the end of the show, she surprised her audience when she suddenly threw off her gown to reveal her nakedness live on stage. What a weird lady! someone please tell her it’s a bit too early for Halloween.